For the last few Tuesdays, we’ve been faced with a dilemma. When the clock strikes ten, do we tune in to Fresh Meat on Channel 4, or Cuckoo on BBC Three? Having spent all year watching and re-watching The Big Bang Theory and How I Met Your Mother to the point of over-saturation, it’s a little frustrating that when two genuinely amusing British comedies hit the screens, their programming slots collide. The return of Fresh Meat heralds a new term at the fictional Manchester Medlock University. There’s a new Dutch housemate, a tiny triangular beard – sorry, soul patch – and boozy-bix has downgraded to meaty-bix, thanks to Howard taking a job in an abattoir. The success and appeal of Fresh Meat undoubtedly lies in the fact that almost anyone who has been to university can identify with at least one of the characters at some point in every episode. JP’s appropriation of biros and mouse mats, for example, could have been scripted by my boyfriend, who once collected seventeen free pens and a wooden spoon at a societies fair. Competing with the students for screen time is Cuckoo, a new sitcom starring Greg Davies as a middle-class, Lib-Dem Dad whose daughter returns from her gap year with an American ‘spiritual ninja’ called Cuckoo – who she has married and brought home to live with the family. 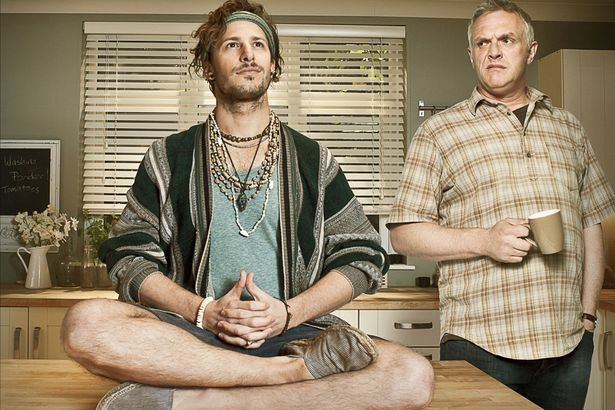 Andy Samberg, of The Lonely Island fame, plays Cuckoo and is a brilliant counter to Greg Davies as Ken. Whether he will save the world by selling baked potatoes remains to be seen, but even the more cringe-worthy scenarios have been more funny than painful and I’ll be happy to watch a second series if it gets re-commissioned. Of course, it’s not as if the decision of which one to watch on Tuesday at 10pm negates ever seeing the other, as we have the wonders of Virgin Media’s catch up service at our disposal. It just means I have to decide which regular tea-time show gets relegated in Fresh Meat or Cuckoo’s favour: that Big Bang episode I’ve seen three times already or the HIMYM that was originally broadcast two seasons before the episode I watched only yesterday? April has been an incredibly busy month for me. In addition to my day-to-day work at a library, a production company and a theatre (yes, I currently have three jobs and rarely know if I’m coming or going!) I’ve also been involved with a storyline for Season 5 of PERSONA, the world’s first ongoing soap opera for smartphones. PERSONA is free to download on both iTunes and the Android market, with a three-minute ‘appisode’ coming direct to your smartphone every day. As well as being an innovative concept that provides a great nugget of free daily entertainment, PERSONA offers aspiring writers and directors a chance to try their hand at creating some of the storylines in each season. My friend Matt applied to do this and a few short weeks later, Adam and Sarah’s Story was born. 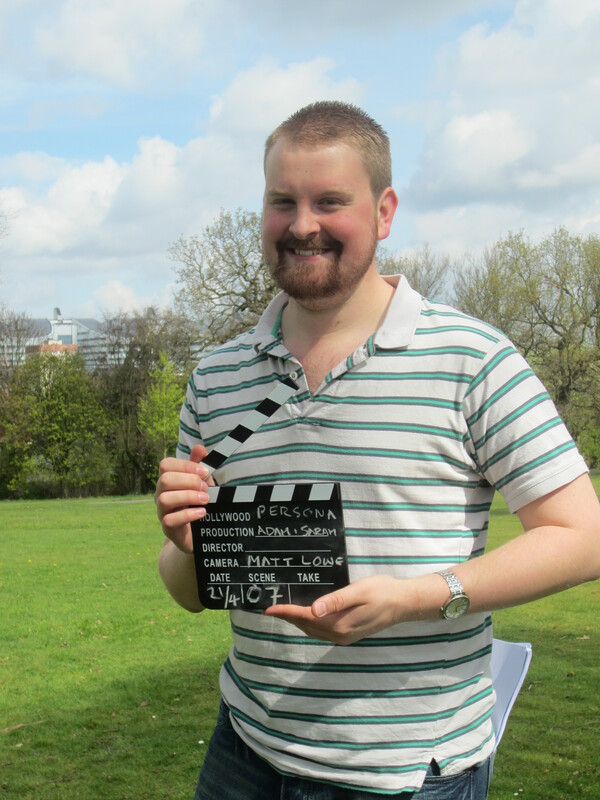 Matt and I met at University several years ago and both studied the same Film and TV Masters course after completing our undergraduate degrees in History. When he asked me if I wanted to be involved in PERSONA, I immediately said yes. My main role has been to promote Adam and Sarah’s Story through social media and I was also a Production Assistant on the first day of the shoot last weekend. It’s been a brilliant experience, not only to work with Matt and other friends from the MA again, but also to work with a lovely cast and to delve briefly into the world of drama. Post-production is now underway and I can’t wait to see the ten completed scenes. The purpose of today’s post is, I’ll admit, to ask you nicely to check out the Adam and Sarah’s Story blog I set up to chart our progress with the project. There’s information about the cast and crew, plenty of photos and even some hints of what’s in store for Adam and Sarah when their story hits smartphone screens later this year. If you’re looking for something new to fill a few minutes of your day, at no cost, PERSONA could be the answer. The Power Is In Your Hands…But By What Name? What do you call the Remote Control? This has a nice sing-song feel, but I can’t imagine it being used in anger when the said Doo-dah has vanished under the sofa. “I can’t find the damn doo-dah!” Nope, just doesn’t work. 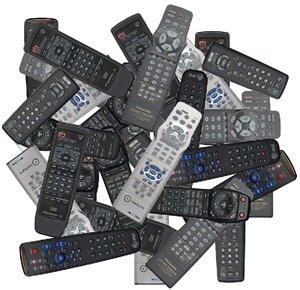 It’s used by the best of us in those moments of memory lapse, but I have been told that in some families The Whatsit is the standard name for the remote. Must get confusing when you’re having a forgetful day and are looking for a different Whatsit though. Definitely my favourite alternative name, apart from Button Box, of course, as it combines logic with popular culture – if you actually don’t get the Thomas the Tank reference here, shame on you. Thanks to Andy for telling me about The Bodger. Not one I’ve come across before today, but if I had two remotes I’d definitely now be inclined to differentiate between them by naming them Bodger and Badger. On second thoughts, that might get confusing. In my mind, The Zapper evokes imagery of space battles or wizards duelling. Has anyone invented a remote control that flashes when you press a button or has epic sound effects? I’m sure the novelty would wear off soon enough but the idea is enough to make Zapper another strong contender. I was going to end the list there, but these three just came into conversation at the last minute and who can resist The Flicker, The Doodler or, best of all, the Digga-Digga? Well, I know the answer to that: everyone who just sticks with calling it the remote control. I just came across this Radio Times blog post about Spooks and Downton Abbey, which both start again a week on Sunday. Near the bottom it reads: “most people still like their TV on a plate…”, in reference to the fact that Downton will almost certainly get higher ratings due to its post X Factor slot. 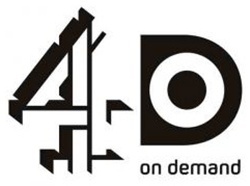 My first thought was, ‘if only I could somehow link that one phrase to this blog!’ My second was that actually, as I wrote in my first How I Watch TV post, iPlayer and other on demand services do give us our TV on a plate, as and when we want it. Yes, sometimes we’ll end up watching something because we couldn’t summon the energy to change channel, but (and I apologise if this is extending the metaphor painfully) this is the equivalent of having a meal served that you may not like, but end up eating anyway. Sure, you may end up sampling a tasty dish that you’ll subsequently order every week, but with iPlayer et al. you can pick your favourites and consume them at your convenience. In short, I don’t believe that being part of an ‘inherited audience’ is the only way in which viewers get telly on a plate. I will certainly be tuning in to Downton Abbey on the 18th, but this is due to Maggie Smith rather than Gary Barlow.